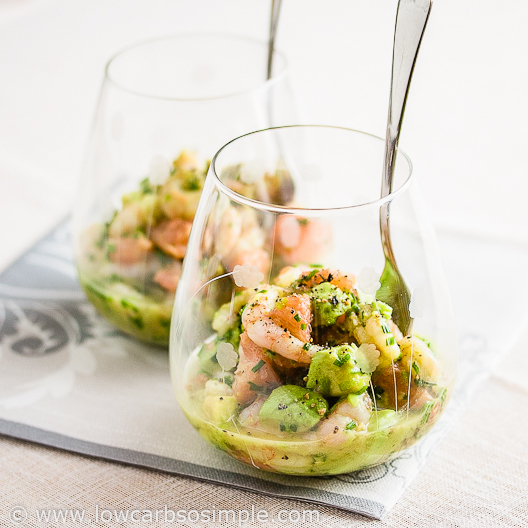 Shrimp, Avocado and Red Grapefruit - Low-Carb, So Simple! -- gluten-free, sugar-free recipes with 5 ingredients or less | Low-Carb, So Simple! If you have some cookery skills, you know how to remove pulp so that the result is free from pith or membranes. Feel free to use that method if you like. Because this dish benefits from some extra juice, I use the following method to remove the pulp. Well, nothing complicated, just like if I was about to eat the fruit. Scoop the pulp with a small spoon and put the pulp in a bowl. Scrape all the pulp and spoon all the juice you can get. Don’t worry if the pieces of grapefruit are small. It’s actually better, there is a lot of juice which makes the ready dish tastier. How to handle the avocado, then? Here is my method: Cut the fruit in half. Hit a big knife to the center of the pit. Be careful with your hands and fingers. Lift the pit from its place with the knife. Discard the pit. After the pit is removed, scoop out the flesh with a spoon. Try to get all the flesh in one piece. If the avocado is ripe, this should be relatively easy. Cut the avocado flesh in even-sized cubes. Shrimp, then. I use frozen shrimp meat almost every time when I need some shrimp. It’s cheap and easily available. Moreover, you don’t have to worry that the meat spoils soon, like it is with non-frozen shrimp meat. I developed a handy way to thaw shrimp quickly based on the method I learned a couple of decades ago when I had a summer job in a hamburger restaurant. The original method called for thawing the shrimp under a running tap. My method, however, saves some water. So, here is the method: Put the frozen shrimp in a bowl with cold water. When the shrimp begins to thaw, take another bowl with lukewarm water and put the shrimp there. Wait until the shrimp is completely thawed. Don’t use too hot water, the shrimp becomes easily tough. When the shrimp is completely thawed, discard the water from the bowl and squeeze the shrimp very gently so that the excess water is removed. Another method to thaw shrimp is to put the shrimp in cold water or milk for about one hour. Drain the shrimp and pat dry with towel. The most time-consuming part is now done, you are almost there. It’s time to chop the chives. You can add a pinch of salt if you think the appetizer lacks salt. I often add salt to my shrimp because I’m a real salt lover. Unrefined sea salt lover. Just before serving, grind plenty of black pepper on top of each portion. Carefully remove the pulp from the grapefruit, cut in bite-size pieces and put in a large bowl. Discard the peel, pith and membranes. Remove the flesh from the avocado. Discard the peel and the pit. Dice the flesh. Put in the bowl with the grapefruit and mix gently with a spoon. Thaw the shrimp and put in the bowl with the grapefruit and avocado and mix gently. Chop the chives into small pieces. Add the pieces to the bowl where you have everything else and mix gently but thoroughly. Divide the mixture between 4 serving bowls or glasses. Top with plenty of freshly ground black pepper. I wanted some fresh flavors for the spring. Something with red grapefruit. Well, it’s not a fruit with the lowest carb count — on the other hand not too high either — and I’ve been fancying it for some time now. In any case it has quite a strong taste, so you don’t have to use it much. I thought of a salad with red grapefruit. With its creaminess and fattiness, avocado would complement the lightness of the grapefruit. A salad with just grapefruit and avocado would be naturally quite bland, so I wanted to add some protein. Something elegant. Shrimp! Shrimp would go perfectly with avocado. In my opinion shrimp demands some citrus flavor — there the red grapefruit would come in. It would also prevent the avocado from turning brown. I still needed some seasonings. Avocado — and shrimp as well — would benefit from garlic or at least some onion-type flavor. I tried thin slices of fresh garlic. Far too overpowering! I needed something milder. Garlic powder didn’t taste good either. I was pondering different varieties of onions. Luckily I had some fresh chives. That was perfect with red grapefruit, avocado and shrimp. Not too pronounced, but mild and spicy at the same time. I got exactly that onion-type flavor what I was looking for. The appetizer still needed some spice. I went through my pantry and tried almost every spice I found. Here are some examples I tried but with which I wasn’t satisfied: thyme, rosemary, dill (surprise! I was so sure that it would be perfect with shrimp), parsley, white pepper, garlic bread seasoning, Cajun seasoning, Garlic ‘n Herb, all-purpose seasoning and cayenne (another surprise! Usually chili and hot peppers go well with shrimp. I guess now the red grapefruit was the party-pooper). Finally, I tried a very basic seasoning: black pepper. That was a perfect addition to the flavor bundle. I was ultimately satisfied. You can also serve the appetizer as lunch salad. For a bigger hunger you can have two servings of the appetizer. Prepare the appetizer and store in the fridge in an airtight container. When you are ready to eat, assemble the salad by putting your favorite mixed salad greens on a plate and top with the appetizer. NB: After the shrimp is thawed, keep it refrigerated and use within a few hours. Please feel free to experiment more with your favorite spices. Since we all have different tastes, I would be delighted to hear what are your favorite spices with shrimp, avocado and red grapefruit ! Hope you find those useful! Hehehe, not me then 😉 Looks good though. Yum! This looks so good – can’t wait to try it! Lindsay, thanks for your comment! Hope you like the appetizer. You put so much effort and inspiration into every one of your posts, and I am very grateful. Thanks for sharing your talent so freely. I am particularly delighted with this recipe because I had thought that grapefruit was not a good choice to feed my husband (I love it), and now see that combined with other low carb ingredients would be allowed. Thanks, Kathy, for your nice words! The pleasure is mine. I’m happy if people find my recipes useful as I really love to experiment and develop new recipes. Hope you and your husband like the appetizer.